You are here: Home » Schneider-Brooklyner Hopfen Weisse: Do the New World and the Old Really Mix? 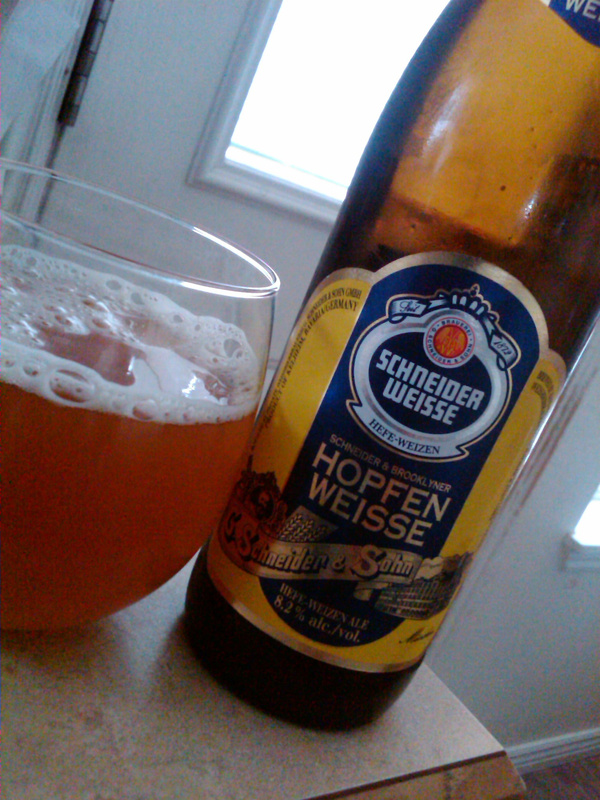 Schneider-Brooklyner Hopfen Weisse: Do the New World and the Old Really Mix? This beer is truly a collaboration that makes an impact. Not that it made huge waves in the beer world, but it definitely made a big impact on my tongue! Basically Garrett went to Germany and brewed this beer using local hops and ingredients and then Hans-Peter Drexler from Schneider Weisse did the same for a Brooklyn version. This is the Schneider version and it is an interesting rendition of a super hoppy Weizenbock. This brew was dry hopped (a lot) with Hallertauer Saphir hops from hop farms that are within a couple miles of the brewery. This takes an old world Weizenbock and “Americanizes” it by being rather heavy handed with the hops. I’m not sure it is a great idea to get heavy handed with Hallertauer Saphir hops. They have a very sharp citrus quality that reminded me at first of an orange breakfast bread of some sort, but ultimately turned into a lemon pledge type flavor. It poured an orange color that was very cloudy with a thin head that was somewhat uneven or lumpy. Left some lacing on the glass too. The nose was amazing, very floral and zesty. Overall, and despite the lemon pledge flavor, I would buy this beer again. It had some really worthwhile qualities. It was light and crisp, and had some refreshing qualities, and at 8.2% ABV it had a nice buzz factor. All in all a good beer but perhaps not a great one. ← GABF: Custom T-Shirts or no Custom T-Shirts? You’re right, it may be blasphemy. But I do like this beer. Had it on several occasions this summer and shared with friends. The reaction was always initial brow raising and then “Wow.” There’s a lot going on in this Weizenbock. Too bad we cant get the Drexler version to compare side-by-side. That would be very interesting as I’m sure the hop presence is somewhat moderated and the different varietals used would be interesting. Jim? Snag a bottle for us? One of the my favorite beers from last year! I really enjoyed it and found that the relatively high ABV could sneak up on you. (well, not me, but perhaps you) Strangely, this imported version of the collaboration brew is more expensive than the domestic version of it. Aren’t the imports usually more expensive than the domestics? I liked this beer, but it is a cautionary recommendation as it has some challenging flavors. Yes, usually that’s the case. I don’t remember if the Domestic version was in a bigger bottle or not – maybe that would ‘splain it. Great collaboration beer. Loved this beer and its counterpart as well; both versions are easily obtainable in New Jersey. You hear that Jim? Both are available in NJ. Send me the Brooklyn version! Which version did you like best Rob? I’m still really digging this beer as the temps are on the closer side to 100. For me it’s nice and creamy with all the characteristics that I love from both Hefeweizens and IPA’s. I love how the floral qualities of the IPA mesh with the somewhat tart and spicy flavors of the yeast. I had the Brooklyn version at the beginning of the year, ole’ Ricky bought a bottle online, unfortunately we drank it before we had the Schneider Weisse version in the store so we could compare them side-by-side. I do remember I liked it, a lot, and frankly, that’s what matters! It was a really nice and floral beer. I felt like there was a cloying flavor that I couldn’t really put my finger on but to say citrus. Soometimes it seemed orange, and other times lemon, like that lemon pledge quality I referred to, other than that this was a beautiful beer and very well crafted.